Childhood and young adulthood is characterized by making friends, learning personal reliance, and gaining a greater sense of self. In addition, most individuals would agree that children and young adults spend a great majority of their time obtaining an education. While there are a number of ways in which young individuals can get an education, reading, studying, and attending educational classes may be most effective. Years ago, a high school education was considered an adequate form of education for individuals who hoped to seek professional employment. Today, however, as the workforce becomes more and more competitive, a college education may become necessary. To obtain admission to specific colleges, universities, or technical schools, students traditionally need to take—and score well on—aptitude tests. The Scholastic Assessment Test, or SAT, is a test specific designed to evaluate the knowledge and test-taking ability of high school students. In addition, the test is commonly used by college administrators to evaluate how effective and functional a specific student will be in the college setting. Originally introduced in the mid-1920s, the SAT has changed quite dramatically in both form and function over the past several decades. It is important to note that while SAT scores can play an important role in determining acceptance into institutions of higher learning, they are not the sole factor. In fact, a combination of SAT scores, grade-point average, and extra-curricular activities is considered when granting college admission to high school students. Currently, the SAT is divided into three distinct sections, which test a student’s ability in the areas of reading, mathematics, and writing. A students’ skill in each of these areas will be ranked on a scale of 200-800, resulting in a total score of 600 to 2400. While the SAT takes a total of three hours and 45-minutes to complete, it is not uncommon for test administrators to allow participants several, 15 to 30-minute timed breaks. These breaks allow students to use the bathroom, get a drink of water, and otherwise relax from the stressors of the exam. Without question, success on the SAT is essential for individuals who hope to obtain admission to institutions of higher education. Depending on the school to which the student has applied, SAT score requirements may vary quite dramatically. 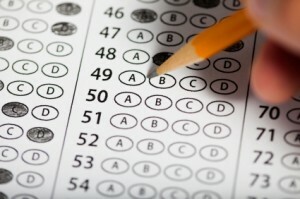 Students who hope to achieve success when it comes to the completion of the SAT are encouraged to prepare several months in advance before attempting the exam. Using online study tools, such as those provided below, can be an effective method of preparation for the SAT. In addition, high school students who need additional assistance when it comes to preparing for the SAT should work with high school guidance counselors or trusted instructors. The Essential Guide to the SAT! HAS Tutoring: SAT Vocab Flashcards: Boost Your SAT Score with SAT Vocab Flashcards! Test Prep Authority: SAT Vocabulary Words—Now as Free, Interactive Video Flashcards! My Max Score: The Online SAT/ACT Prep That Works for You!